The local magistrates were concerned that such a substantial gathering of reformers might end in a riot. The magistrates therefore decided to arrange for a large number of soldiers to be in Manchester on the day of the meeting. This included four squadrons of cavalry of the 15th Hussars (600 men), several hundred infantrymen, the Cheshire Yeomanry Cavalry (400 men), a detachment of the Royal Horse Artillery and two six-pounder guns and the Manchester and Salford Yeomanry (120 men) and all Manchester's special constables (400 men). The main speakers at the meeting arrived at 1.20 p.m. This included Henry 'Orator' Hunt, Richard Carlile, John Knight, Joseph Johnson and Mary Fildes. Several of the newspaper reporters, including John Tyas of The Times, Edward Baines of the Leeds Mercury, John Smith of the Liverpool Mercury and John Saxton of the Manchester Observer, joined the speakers on the hustings. At 1.30 p.m. the magistrates came to the conclusion that "the town was in great danger". William Hulton therefore decided to instruct Joseph Nadin, Deputy Constable of Manchester, to arrest Henry Hunt and the other leaders of the demonstration. Nadin replied that this could not be done without the help of the military. Hulton then wrote two letters and sent them to Lieutenant Colonel L'Estrange, the commander of the military forces in Manchester and Major Thomas Trafford, the commander of the Manchester & Salford Yeomanry. The Manchester & Salford Yeomanry entered St. Peter's Field along the path cleared by the special constables. As the yeomanry moved closer to the hustings, members of the crowd began to link arms to stop them arresting Henry Hunt and the other leaders. Others attempted to close the pathway that had been created by the special constables. Some of the yeomanry now began to use their sabres to cut their way through the crowd. Tyas was released from prison. The Times mounted a campaign against the action of the magistrates at St. Peter's Field. In one editorial the newspaper told its readers "a hundred of the King's unarmed subjects have been sabred by a body of cavalry in the streets of a town of which most of them were inhabitants, and in the presence of those Magistrates whose sworn duty it is to protect and preserve the life of the meanest Englishmen." As these comments came from an establishment newspaper, the authorities found this criticism particularly damaging. By John Simkin (john@spartacus-educational.com) © September 1997 (updated January 2017). 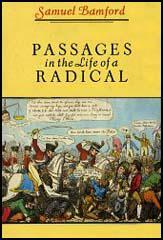 (1) In his book Passage in the Life of a Radical, the political activist, Samuel Bamford described the procession from Middleton to Manchester on the 16th August, 1819. First were selected twelve of the most decent-looking youths, who were placed at the front, each with a branch of laurel held in his hand, as a token of peace; then the colours: a blue one of silk, with inscriptions in golden letters, 'Unity and Strength', 'Liberty and Fraternity'; a green one of silk, with golden letters, 'Parliaments Annual', 'Suffrage Universal'. Every hundred men had a leader, who was distinguished by a spring of laurel in his hat, and the whole were to obey the directions of the principal conductor, who took his place at the head of the column, with a bugleman to sound his orders. At the sound of the bugle not less than three thousand men formed a hollow square, with probably as many people around them, and I reminded them that they were going to attend the most important meeting that had ever been held for Parliamentary Reform. I also said that, in conformity with a rule of the committee, no sticks, nor weapons of any description, would be allowed to be carried. Only the oldest and most infirm amongst us were allowed to carry their walking staves. Our whole column, with the Rochdale people, would probably consist of six thousand men. At our head were a hundred or two of women, mostly young wives, and mine own was amongst them. A hundred of our handsomest girls, sweethearts to the lads who were with us, danced to the music. Thus accompanied by our friends and our dearest we went slowly towards Manchester. The morning of the 16th of August came, and soon after nine o'clock the people began to assemble. From the windows of Mr. Baxter's house in Mosley-street, I saw the main body proceeding towards St. Peter's Field, and never saw a gayer spectacle. There were haggard-looking men certainly, but the majority were young persons, in their best Sunday's suits, and the light coloured dresses of the cheerful tidy-looking women relieved the effect of the dark fustians worn by the men. The " marching order," of which so much was said afterwards, was what we often see now in the processions of Sunday-school children and temperance societies. To our eyes the numerous flags seemed to have been brought to add to the picturesque effect of the pageant. Slowly and orderly the multitudes took their places round the hustings, which stood on a spot now included under the roof of the Free Trade Hall, near its south-east corner. Our company laughed at the fears of the magistrates, and the remark was, that if the men intended mischief they would not have brought their wives, their sisters, or their children with them. I passed round the outskirts of the meeting, and mingled with the groups that stood chatting there. I occasionally asked the women if they were not afraid to be there, and the usual laughing reply was - " What have we to be afraid of?" I saw Hunt arrive, and heard the shouts of the sixty thousand persons by whom he was enthusiastically welcomed, as the carriage in which he stood made its way through the dense crowd to the hustings. I proceeded to my dwelling-house in Salford, intending to return in about an hour or so to witness in what manner so large a meeting would separate. I had not been at home more than a quarter of an hour when a wailing sound was heard from the main street, and, rushing out, I saw people running in the direction of Pendleton, their faces pale as death, and some with blood trickling down their cheeks. It was with difficulty I could get any one to stop and tell me what had happened. The unarmed multitude, men, women, and children, had been attacked with murderous results by the military. The magistrates had resolved, at the last moment, that Hunt, and the friends who accompanied him to the hustings, should be apprehended in the face of the meeting. It was a great assemblage, and, no doubt, they thought the capture of the ringleaders in the presence of sixty thousand persons would produce a salutary effect. There was abundance of force at hand to render resistance hopeless. The number of special constables had been greatly increased, two hundred additional having been sworn in for the occasion; a portion were stationed round the hustings, and another formed a line of communication thence to the house in which the magistrates were assembled, a distance of about a hundred yards. Near to the field, ready the moment their services were required, were six troops of the 15th Hussars, a troop of horse artillery, with two guns, the greater part of the 31st regiment of infantry, some companies of the 88th regiment, the Cheshire yeomanry; of between three and four hundred men, and the Manchester yeomanry, of about forty, the latter hot-headed young men, who had volunteered into that service from their intense hatred of radicalism. (3) With John Tyas in prison it is believed that John Edward Taylor provided the report that appeared in The Times on 18th August, 1819. When the Yeomanry arrived the greater part of the persons who were at the outskirts of the assembly on that side instantly ran away; but the main body remained compact and firm, and finding the soldiers halt under the houses, faced round and cheered them. But a few moments had elapsed, when some orders were given to the troops, and they instantly dashed at full gallop amongst the people, actually hacking their way up to the hustings. A cordon of special constables was drawn from the house occupied by the Magistrates towards the stage, and these fared as ill from the attacks of the soldiers as the people at large. A comparatively undisciplined body, led on by officers who had never had any experience in military affairs, and probably all under the influence both of personal fear and considerable political feeling of hostility, could not be expected to act either with coolness or discrimination; and accordingly, men, women, and children, constables, and Reformers, were equally exposed to their attacks. Numbers were trampled down, and numbers were cut down. When they arrived at the hustings, the standards were torn, or cut from the hands of those who held them. Hunt was taken along by the constables to the house where the Magistrates were sitting, crying out 'Murder' as he was every instant struck by the bludgeons of numbers of constables who surrounded him. An attempt was made to knock his hat off, but unsuccessfully; and just as he was going up the steps, a person, who shall be for the present, nameless, with a club of large size, struck him with the force of both hands a blow on the head, which completely indented his hat, and almost levelled him with the ground: of this I can produce evidence on oath. Whether the Riot Act had been read, I am not enabled positively to say; but I affirm, from actual observation, that not the slightest breach of the peace had been committed, or appeared, as far as I can judge, likely to take place; and, most certainly, instead of an hour being allowed after proclamation, for the people to disperse, not twenty minutes had elapsed, after. Hunt came upon the ground, before the carnage began. What are the charges on which Hunt and the rest are arrested, I know not. Rumour says High Treason, of which carrying the cap of liberty is stated as an overt act. (4) In his book Passage in the Life of a Radical, the political activist, Samuel Bamford described the attack on the crowd at St. Peter's Fields on the 16th August, 1819. Mr. Hunt, stepping towards the front of the stage, took off his white hat, and addressed the people. Whilst he was doing so I heard a noise outside the crowd. Some persons said it was the Blackburn people coming, and I stood on tip-toe and looked in the direction whence the noise was coming from, I saw a party of cavalry in blue and white uniform come trotting, sword in hand. The cavalry received a shout of good-will. The cavalry, waving their sabres over their heads; and then, slackening rein, and striking spur into their seeds, they dashed forward and began cutting the people. "Stand fast," I said, "they are riding upon us;" The cavalry were in confusion; they evidently could not, with the weight of man and horse, penetrate that compact mass of human beings; and their sabres were plied to cut a way through naked held-up hands and defenceless heads. "Shame!" was shouted then "break! break!" they are killing them in front, and they cannot get away." On the breaking of the crowd the yeomanry wheeled, and, dashing whenever there was an opening, they followed, pressing and wounding. Women and tender youths were indiscriminately sabred or trampled. A number of our people were driven to some timber which lay at the foot of the wall of the Quakers' meeting house. Being pressed by the yeomanry, a number sprung over the balks and defended themselves with stones which they found there. It was not without difficulty, and after several were wounded, they were driven out. A young married woman of our party, with her face all bloody, her hair streaming about her, her bonnet hanging by the string, and her apron weighed with stones, kept her assailant at bay until she fell backwards and was near being taken; but she got away covered with severe bruises. In ten minutes from the commencement of the havoc the field was an open and almost deserted space. The hustings remained, with a few broken and hewed flag-staves erect, and a torn and gashed banner or two dropping; whilst over the whole field were strewed caps, bonnets, hats, shawls, and shoes, and other parts of male and female dress, trampled, torn, and bloody. Several mounds of human flesh still remained where they had fallen, crushed down and smothered. Some of these still groaning, others with staring eyes, were gasping for breath, and others would never breathe again. There are mugs and candlesnuffers in museums saying "Do not forget 1819" and school essay questions going back to the earliest days of exams, but the site of one of Britain's greatest social upheavals is still marked only by a modest - and only partially true - blue plaque. This week, the city whose conscience was seared by the death of nine men, a woman and a child at a mass demonstration demanding the vote, will see the launch of a campaign for a "prominent, accurate and respectful" memorial to the brief mayhem known to history as the Peterloo massacre. People and institutions in Manchester and Salford are banding together to press the city council for a "worthier monument" than 32 words on the plaque which fail even to say that anyone was killed, alluding instead to the crowd's "dispersal by the military". Events this Thursday - the massacre's 188th anniversary - will highlight concern that Peterloo is in danger of being forgotten. "We're talking about something here on the scale of Tiananmen Square in terms of democratic history," said Paul Fitzgerald, who draws radical cartoons under the name Polyp and is one of the organisers of the Peterloo Memorial Campaign. "It's ridiculous that all we have is this euphemistic plaque. We intend to commission a sculpture in the end, but in the meanwhile, let's get people talking." The project is backed by local trade unions, and Labour and Liberal Democrat politicians who say the occasion has for too long been treated "as a secret". "Even people who know the history come to Manchester and fail to find out where Peterloo happened," said Derek Clarke, secretary of Greater Manchester Trade Union Councils. "I arrived from north Wales to work here, and it took me ages to pin down the actual site. "We don't want to fall behind our neighbours, such as Hyde which has just unveiled a statue outside its town hall of the Chartists, who drew much of their inspiration from Peterloo. The massacre was one of the most influential events to happen in Manchester's history." Peterloo saw an estimated 60,000 people gather peaceably to back demands that the growing industrial towns of Britain should have the right to elect MPs. Less than 2% of the population had the vote at the time, and resentment was sharpened by "rotten boroughs" such as the moribund Wiltshire village Old Sarum which had 11 voters and two MPs. Manchester and Leeds had none. Plans to elect a "shadow parliament" put the wind up the Tory government which was also frightened that the power of Henry "Orator" Hunt, the main speaker at Peterloo, might turn the Manchester crowd into a mob. The local volunteer yeomanry, described as "younger members of the Tory party in arms", was ordered to disperse the meeting, with fatal results. "The magistrates effectively let local shopkeepers and businessmen, people with a stake in the status quo, loose on the crowd," said Mr Clarke. More than 1,000 disciplined regular troops, including an artillery unit, stayed in the background but added to the air of crisis. As well as the 11 deaths, and possibly a 12th which historians are still researching, hundreds of people were wounded by sabre slashes and crushed in the panic. The name Peterloo, combining Manchester's traditional meeting place St Peter's Fields with the battle of Waterloo fought four years earlier, was coined immediately by the radical Manchester Observer. The immediate result of the tragedy was a complete crackdown on reform, but it proved hugely influential in the longer run. "It is fundamental to the history of our democracy," said Tristram Hunt of Queen Mary College, London University, who last year organised a national competition in the Guardian for radical landmarks in need of better commemoration which saw Peterloo come second only to Putney parish church, site of the 1647 Putney debates where rank and file members of the Roundhead army argued the case for a transparent democratic state. "It is really great news that Manchester is on the march about this. 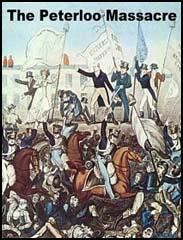 Peterloo has a direct and powerful lineage to the Chartists." Manchester has seen previous, short-lived attempts to highlight the massacre before, but the reaction in the immediate aftermath - that the violence was a stain on the city's reputation - has regularly resurfaced and sapped enthusiasm. The Labour-led city council has prevaricated about anything grander than the plaque on the Radisson Hotel. Last year's Labour conference in Manchester saw delegates surprised at what some called a virtual conspiracy of silence. Former Labour city councillor Geoff Bridson said: "It is like a secret episode from the past." Renewed civic pride offers a real chance to change all that, said Dr Hunt. "The old, rather uncertain Manchester was scared of its history. Now it is confident enough to look back with pride." The campaign is backed by the three museums of working class and "people's" history in Manchester and Salford. The director of the national People's History Museum, Nick Mansfield said: "Peterloo is a critical event not only because of the number of people killed and injured, but because ultimately it changed public opinion to influence the extension of the right to vote and give us the democracy we enjoy today. It was critical to our freedoms." It is great news to hear (History, August 13) that a Peterloo memorial campaign has been organised. But hopefully the organisers and journalists will get abreast of recent research. It is now known there were as many as 18 deaths, not 11-12, with total casualties revised upwards from around 500 to 700, with the majority of injuries inflicted by the military rather than by the crush of the crowd. All this is examined in my recent book, "The Casualties of Peterloo". In addition, the massacre was the work not only of Mancunians serving as volunteer cavalrymen but of regular troops, since 340 Hussars also charged the crowd. For Mancunians and even for the development of democracy, the event is not so easy to appreciate as you suggest. After all, the massacre was carried out by respectable Mancunians on the authority of the town council. And it is arguable that the event - in showing how crowds could be effectively controlled by small numbers of troops - delayed the establishment of democracy by over 50 years. Peterloo represented a humiliating defeat for the power of the people and one from which it had great difficulty in making a recovery. Geoff Bridson says Peterloo "is like a secret episode from the past", but many books have been written about it over the last half century. Lecturing in Saddleworth on a cold February night last year, I found myself talking to a full house. As for Derek Clarke's difficulties in identifying the actual site, all he needed to do was to visit the magnificent Manchester library, a stone's throw from the site, and the staff in the local studies unit would have gladly directed him to it.